In the last few months, I have helped solve five out of six unknown parentage cases in just a few weeks from mainly third and fourth cousin matches. How? By using the GWorks automation from DNAgedcom combined with AncestryDNA results. These searches used to take many months, even years, with much tedious spreadsheeting and segment analysis. What has changed? Well, Ancestry.com now has a database of over 10 million tests [number updated on 5 aug 2018] plus software to connect trees and DNA. This can make the search easy for Americans without having to use the segment data. My attempt to explain the technique I use of combining GWorks with mirror trees met with glazed eyes in my Adoption workshop last June. I thought my previous write-up was pretty clear but I have not heard back from anyone saying that it had worked for them. So I am trying again with this post today. In an unknown parentage search, the object is to find a common ancestral couple among your DNA matches and build a tree of their descendants until you find someone in the right place at the right time. It seems pretty obvious to me that an automated way to compare trees is best; followed by surname frequencies to check for the spouses, in order to figure out which lines to follow. So why does everyone tune out when I try to explain how to do that with GWorks? Too many steps? Too geeky? By using GWorks to find a likely ancestral couple, I have been able to build down to the grandparents or great grandparents of the adoptee fairly quickly. Then I build the trees back in time for each child’s spouse to find the most likely line. At this point I start using “mirror” or research trees. 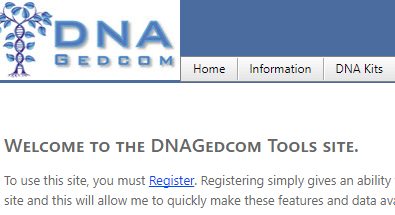 First you have to register at DNAgedcom.com. 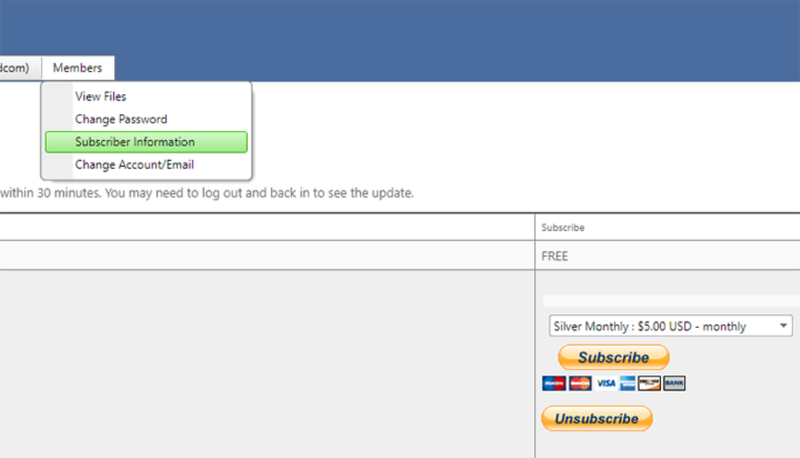 Registering logs you in, so go to the Members menu and click on subscriber information. Sign up for a monthly subscription. You can always unsubscribe once the case is solved. It can take a little time for your “silver” membership to appear and you will need to log out and in again. Once your membership has turned to silver, go back to that subscription page. There should now be a link to download the DNAgedcom client (DGC): one link for PC users and another for Mac users as shown below (as always the red arrow is my addition). WARNING if you have previously downloaded DGC, do it again, you need the latest version which fixes a new problem with Ancestry. When you first run DGC on your computer, you choose the folder it will use to store the files it creates. I created one called DNAGedcom on my PC and used that. Then give DGC your paid DNAgedcom login information. You can always change these from the Options button on DGC’s main page. 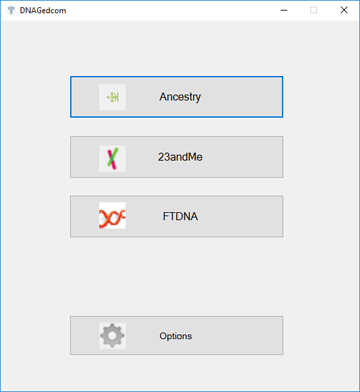 Now choose Ancestry from the buttons on the main page of DGC. On the next screen, enter your Ancestry login information. Once you are logged in, the names of all the profiles you can see are listed in the profile box drop down. Select the one you are looking into. If this person has 600 or more 4th cousins you might check the Skip Distant Cousin Matches box to save time. With fewer fourth cousins, get them all. In either case, you can check the Quicker Match Gather box. Now click the Gather Matches button. This creates a spreadsheet file called m_profilename.csv in the folder that you previously chose for your DNAgedcom client files. This file has a line for each match with their name, Ancestry’s guesses on the cousinship, number of shared cMs, number of segments, your notes, ethnic regions, a link to their tree and much more. I often make a separate copy of that file and use it to track information about these matches later on. Next have DGC gather the tree information by clicking the Gather Trees button. This can take much longer than the match gathering – a_profilename.csv is the name of the file it creates. No need to gather the ICW information for this particular process. 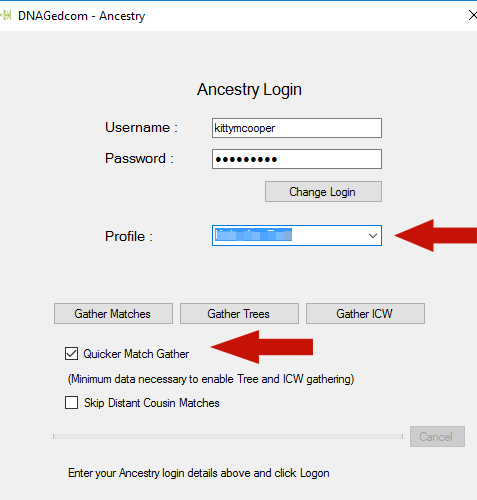 Once the ancestry data is collected, it is time to upload it to DNAgedcom and put GWorks to work. Be careful search angels, each case needs its own account at DNAgedcom so that the files for different people do not intermingle. However you only need one paid account to run DGC since it puts the resulting files on your local computer. To do the upload, log into DNAgedcom in a browser and select Upload Ancestry DNA data from the drop down menu under DNA kits. 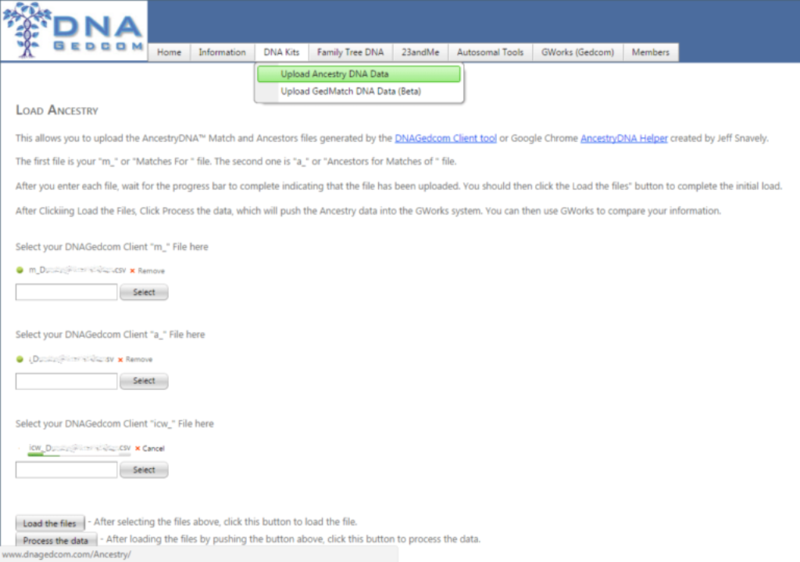 This takes you to a page where you can upload each of those files we just created, the m_ and the a_ files. The ICW file is not needed for this particular GWorks process. Wait for the spinning circle next to the file name to stop before doing the next one. Once all of them are done, click the Load the Files button, wait for that to finish, then click the Process the Data button, and wait for it. The GWorks Manage Tree Files page will generate the analysis files for your database and for downloading. Starting at the top, click the buttons in order – Match Gedcom files, Create Match file, and Create Surname file. This will build the database of information needed for the search. On the GWorks menu there is a “Compare all your Trees” which lists people it found in more than one tree with their birth and death dates in frequency order. See if you can find someone in the 1800s who is in three or more trees that are not all from the same close family. Being in more trees is better of course. How can you tell if they are from the same family? Usually the same surname will appear in all of them, for example, smith42_smith42_ANC and J.P._smith42_ANC. In those cases the same user, smith42, has tested more than one family member. Since any and all of these tree names can be clicked to go to that match at Ancestry, you can usually figure out the less obvious cases of the same family by clicking and checking. The other approach is to download the match csv file and massage it to find a likely couple. That is step 7 in my previous post (click here for it). Create a private, unsearchable tree at Ancestry . Click on one of your matches trees and find the profile of the person you have chosen. Use the Save to Tree from the tools menu while on that profile to copy this presumed ancestor over to your new research tree. On the popup box, click the + add new person on the bottom right. Then click the Save button on the next little screen. Next go back to that profile on the matches’ tree and use the Save to Tree again. This time, type that person’s name in the popup box so it finds his profile in your tree. Now when you click Save, you will get a page like the one from Ancestry ‘s tree hints where you can copy all the family members over as well as the person. Copy the spouse and children over. Go back to your matches tree and save each child to your tree again. You may have to use several trees to get the spouses and children for each. By the way this is fast rather than good genealogy, but do try and copy the most accurate looking trees. Please note, you may have to research some of the children yourself if they are not in your matches’ trees. Other trees, census data, birth and marriage records, familysearch.org, google, and other sites can help. Here is the key tip: Check each child’s spouse’s surname in the View Surname Occurences page at GWorks. If there are no occurrences move on to the next child. This is what speeds the search up. When you find a child with a spouse whose name is in the list repeat the above process for each of their children. The surname occurences search function is a bit unusual but very useful. Type the name or part of the name in the box under Surname and then click the little T thing to get a menu. Click on the way to match it from the drop down menu. This example uses StartsWith. Using surname occurrences to choose which descendants of the couple you picked to research can lead you to the grandparents or great grandparents of the mystery person fairly quickly. You will know you are there because the surnames of both spouses will have many occurences and they will be from recent times. Time to use the mirror tree technique, although here it is just our research tree. Pick a child of these suspected great-grandparents and build that child’s spouse’s tree back four or five generations in your research tree. Now attach the DNA of the person you are helping (or yourself) to this couple. Then wait a day or two and see if the DNA page has any new green leaf hints that are for that spouse’s side. One or two might not be significant so try each child. Usually one spouse’s line will get lots of hints. Now you have found the grandparents. At this point a McGuire diagram of the closest matches can help visualize what you have and whether the DNA works for a child of this couple being the parent or grandparent. (Click here for Blaine’s post about those diagrams). Looking at the McGuire for a recent cases’ great grandparents from a somewhat endogamous group, made it clear which child was the grandparent. That adoptee had six 2nd cousin matches, none with trees, none responding. Once you get to living people, tree building is harder. Obituary searches, Find-a-Grave, people search sites, college yearbooks on Ancestry, Facebook, and lots of sleuthing are what you use to find the unknown parent. Join the mailing list at Yahoo for DNAadoption or DNA detectives at Facebook for advice on this. Sometimes you get lucky and a newly found 3rd cousin pitches in and helps. That was the case for the woman with those six unresponsive 2nd cousins. It took about a month to find her birth parents with GWorks, the 3rd cousin’s help, and a great deal of her own brilliant sleuthing via obituaries on Find-a-Grave. Finally if you are totally confused by this post, or your ancestry is not American, or you just want to better understand all this, I suggest you sign up for a class or two at DNAadoption.com to learn more about how to do these searches. 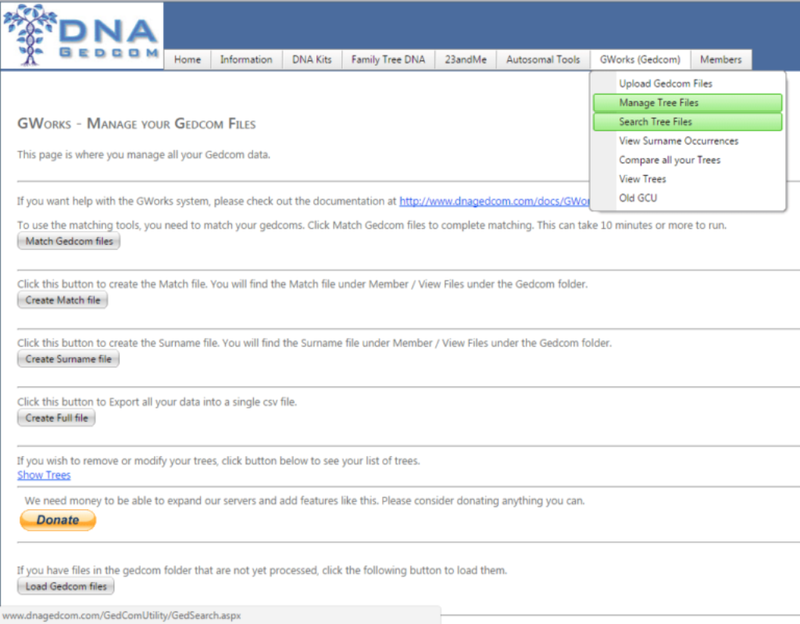 There is also a manual for GWorks linked to from the main page at DNAgedcom.com which includes instructions for using the data from other DNA sites. UPDATE 27 Sept 2017: I made a number of changes based on reader feedback to try to make this post easier to understand. I added quite a bit to the ending- including breaking it out into a step 7 and 8 with more details. Feel free to contact me with additional suggestions. Is the screen shot after Step 4 correct ? Thanks so much Mike, fixed that! I will give this a try! My Grandmother was adopted in 1923 in Pittsburgh. I have DNA matches narrowed down to two family groups but I’m not sure how to pinpoint her exact parents. Will thrs approach work with a brick wall on a 2nd greatgrandparent? Julia, maybe… it depends… if their roots are American and your tree is otherwise known and listed in depth at ancestry so you can tell which ancestral couples are not already in your tree. Frankly for a 2nd grandparent I would get as many descendants to test as are willing to help in the search. Their common matches that are not known cousins can point the way. Thanks for this post. I have loaded them before and for me the biggest issues was that the process involved jumping back and forth to different sections of the menu and some of the instructions on site weren’t clear but they have taken care of that now. Also the process itself takes awhile and to do it successfully you really need to have focus and no interruptions(that can be a problem if you have chat running, own a cellphone or have an employer, employees, children or parents.) This post will be helpful to many who have struggled with this. Thanks very much for this article, which is well-written. On October 4th, I leave for the Apulia region of Italy, where Francine’s ancestors came from. She is now 81, so it is time for her to get to know her origins, even if we never find out who her birth parents were. The tree I’ve built has 7300 people in it (nearly all of Italian origin) : when I get back on October 19th, I’ll try to follow closely the method you propose with Gworks. I already use Gworks, but certainly need a refresher. 2 years ago, when we started, Francine had 35 4C matches on Ancestry ; now she has 163 (nothing better than 4C)…but still no clear path to tread. The database at Ancestry is primarily American with some British and Australian. For more Italian matches upload her ancestry results to family tree DNA and MyHeritage. You may also need to do a separate test at 23andme which also has more Europeans. Hi Kitty. I am managing the search for my husband’s biological parents. Thank you for the DNAGEDCOM update. I had uploaded and downloaded and was then not sure what to do next. When I clicked “manage tree files” up came 324,507 names on 1623 pages, most with dates in the 1600s and 1700s. He is 1/4 cajun, so most of the names are Acadian (thankfully I am also Acadian and immediately recognize them). I am disregarding the french names for now, but he has deep American roots on the other sides and those English, Scottish and Irish names also go way back in the trees. How should I proceed? Thanks so much. Love your blog! In your case, i would run DGC with the skip distant cousins box checked. Then perhaps make a 2nd account at DNAGedcom and use it for doing a GWorks run with the new smaller set of data. That way you can more easily find an ancestral couple to work from. This technique is not as fast with endogamous populations because every child’s spouse will have some occurrences. On the subscriber page under step 1, after I have become a silver member there is no option for me to run this for mac, just the windows option. What can i do?? Kitty, in response to what I hope was not a rhetorical question about why people’s eyes glaze over, I have an explanation. You’re one of the great DNA experts out there, and most people are not up to even ten percent of your ability to do this. Your explanation above seems awfully brief for something that could fill a textbook. DNAGedcom is a very, very geeky piece of software to use, and I stopped paying for it after a couple of months, because I just couldn’t figure out how to make it worth the money. I’ve also pretty much given up on using Ancestry matches, since most don’t have a tree, and few will bother communicating back with you. Even fewer still will upload to GEDmatch, and I’ve just been running my searches with 23andMe, which has added their Relatives in Common feature, which helps me find the relationships between testers even if it is not obvious from their testing surnames. This has led to my finding obituaries, etc. that have been the gold mine of information. Maybe a YouTube video, showing everything step-by-step, and fully explaining all terms used (run this by a few non-genealogy people to see if they can understand it) would be the next logical step in trying to get your message across. Many experts wrongly take silence to mean understanding, when the listener is so overwhelmed that they are intimidated from asking questions for fear of looking stupid. Thanks for the compliment D.R. The reason I like writing this up as a blog post is that then folk can refer to it as they try it themselves. I have submitted this as a possible talk for next June’s SCGS jamboree, if they accept it, they usually video record me and it would be available for purchase. This may be accurate for many, but I believe the real problem is the DNAGedcom software. The homepage is fuzzy and re-directs the user to your blog and others’ PDFs when a true user-friendly program would take the user from one step to the next without having to look back at a document that tells you what’s next. I believe it is easy for you because you know what the program is intended to do. Finally, it takes between 3 to 24 hours to completely do the uploads, which, amid other stuff that goes on in life and with one’s computer, causes re-dos. I am paid for Silver membership and although I have an unknown parentage case I’d like to pass through this, I am seriously considering unsubscribing in protest of its sheer hostility toward the user. @DRHunter: Thank you for those comments. You succinctly summarized my thoughts. Even better than a utube would be one or a group of apps that tell you what your next input should be then does the steps until more input is needed. I’m wondering if perhaps the above reference to “American” should be edited to European American or some such distinction. I am of near 100% European descent, with the heaviest emphasis on ancestry from England/Ireland/Scotland. In addition to working my own lines, I work on my son’s paternal lines which are predominantly of African Ancestry but in American back to colonial times. Though the stats have improved over recent years I have an average of four to five hundred 4th cousins or closer when working on kits of predominantly African American heritage as compared to about thirteen hundred for kits of my close kin sharing the English/Irish/Scottish ancestry. The other consideration is the observation that for a variety of reasons the trees of our African American matches tend not to be very robust. This all leads to a question. When trying to follow the methodology, I started with a Thomas Taylor born in 1780. This was further back than your suggested 1800’s but it was the only name that passed the test of appearing in multiple trees not attributable to the same close family of testers. I was able to take that down to a son Thomas Taylor born in 1813 with a wife Mary Ann Danley – where the Danley surname was in multiple trees. So I tried to work the next generation. Of this generation, the trees only provided info on the marriage of Isaac Lee Taylor to Celia Catherine Cress. The problem becomes that I do not find Cress in my list of people gathered in trees. Am I at a dead end and this exercise did not add value? Since Isaac was born in 1842, he would have reached 20 prior to emancipation; is this a hint he was the “sperm donor” to ancestors of some of our matches (who may be mulatto and not properly recorded in the trees of our matches)? By the same line of thinking was narrowing down to Issac a false premise and could it just as likely have been a sibling that fathered the ancestor of our matches? Your thoughts on this would be appreciated. Thank you, I have added to the above that sometimes you need to research these lines yourself when your matches trees do not have all the children. That would apply to your Thomas Taylor. Plus we Norwegian Americans only get about 100 fourth cousins or better so 400 to 500 sounds great to me! Thanks to this post I finally have Gworks up and running. I am in the UK looking at totally Great Britain and Ireland ancestors. The name that come up with a number kits linking to them seem to all be in the 1700s and very early 1800s and they are all in the USA. I do have groups of names later in the 1800s but they all belong to different people tested by the same person. Is there any was of getting rid of the USA noise. I am looking for a friends missing father, I have her maternal 2nd cousin tested too. Thanks Kitty, this is the first time I have read something about DNAgedcom, tried it and it actually worked perfectly! Thank you for this incredibly helpful information!! I’m working on my adopted friend’s case, and she has only tested using the 23andme v5*, not on Ancestry. Is there a way to make Gworks work for those who have only tested at 23andme, or is it just Ancestry? *rant: unfortunately is incompatible with GEDMatch now (GEDMatch Genesis is still in beta and few matches are available on that site) AND with V5 transfers to FTDNA are no longer possible! Have her test at ancestry, Because their database is so large, adoptees with American roots are having the most success there. Thanks for the helpful article. Just one question, I’m trying to identify an unknown grandfather and I have 3 of his grandchildren (siblings) with two on ancestry and one on 23andme. Am I correct in thinking I am best to load all three siblings data into the system to compare all the trees from the three of them? Is it even possible do this? I realise there will be duplicate ancestors from the shared matches but will it be easy to differentiate the common ancestors from not shared matches i.e. sibling 1 has bob smith in a match’s tree and sibling 2 has bob smith in a different match’s tree. Will there be any other problems or issues with doing this? This is a tricky question. The 23andme account is unlikely to be useful as there is no tree information collected. I would suggest that you load the two at ancestry into a single account because, as you say, you can click on the highest frequency common ancestors and check if they are in both. However it might be easier to also load one of them to a separate account so you can quickly eyeball if an ancestor is in both. Thanks Kitty, yes I realised the 23andme “no trees” thing straight after I posted that! But I do have 2 on ancestry and all three of them on FTDNA so will throw all the data into one account and see how I get on. As you say at least it will put the most common names from all the trees at the top of the list so I can just work my way down the list 🙂 I also have a child of the 4th deceased sibling and waiting for a child from the 5th so I’ll be attempting to have 5 peoples’ trees from both ancestry and FTDNA all in the same database… Hopefully its manageable, thanks for asking them about a feature to make this approach more workable! It will be easy to see the duplicates from ancestry shared matches as they will be attached to the same person/user which is shown clearly in the database. It will be harder to see the duplicates where someone has transferred from ancestry to FTDNA and created a tree there as well. The match/user name from ancestry and FTDNA will not necessarily be obviously different so you’ll think you have found a common ancestor but you haven’t of course. A quick check of the actual trees will solve the problem but that time consuming. Other than that issue it should be easy to read the data straight from DNAGedcom database presentation I think? I am following your steps, but I am stuck at step 2: Gathering Trees. I keep trying, but it keeps saying Operation Cancelled – No trees were saved. Do you have any suggestions? I am using a Mac and on Chrome. I greatly appreciate any help you can provide! There were some issues with ancestry very recently but I think they are fixed now. So try again. How to link? At ancestry.com you can attach your DNA to a person in one of your trees there via the setting page (button on top right of your DNA page). Midway on that settings page is a section titled “Family Tree Linking” where you can link your DNA test to a person in a tree. As an adoptee from an adoptee I’m trying to work out who my paternal grandfather was, I had 3 matches that I was quite focused on as being my link to the unknown, following Kitty’s instructions and advice this method blew my theory out of the water and placed the 3 matches firmly in my maternal line within 5 minutes of making a mirror tree, so although i’m no closer to finding paternal grandfather it is a fantastic tool to place people, now I just need to pick the right line to follow. Hello Kitty! Thank you so much for sharing this! I hope it will help me to determine my own unknown parentage. I am attempting to use the client now but am having issues with gathering trees. I am getting an error message that the operation has been cancelled. Any suggestions? FYI I am working on a MAC and am using the appropriate client. Kitty, I’m not tuning out. My problem is trying to wade through all the gadgets on the mac air to just get to the point of imputing. I see your work as absolutely the way. I do have a adoptee related to me and I know the ancestral couple. This couple had 8 sons and 4 daughters born in the late 1800 and had their children around 1910. I have a lot of information, but no bioparents names. The problem is what you described: finding that line among all the surnames. The adoptee is a little conflicted and some days she cares and other days she’s not interested. We both traced her highest match at 911 /32 and it’s a whole family living in the adoptees state close to her city. They won’t respond and they have no tree. I’ve written so many of her matches asking about her and no one responds or they say they don’t know her-not the adopted, but their own known relative. I think that’s what’s disheartened my adoptee. I am related to that same highest match though on a lower match. I also know the ancestral couples two sons who lived where the adoptee lives and their children’s names. I got a lot done with only a few trees. The adoptee just now took out a 14 day trial with only six days left. I’ve used my iPad to take snapshots of Matches and dna. I know you are busy so I’m not asking. But when you manage to get a little time, I could use some advice. Have a great conference. Well, I read the above posts so I guess I’m out too. I joined and paid a donation, but I thought I read that there were guidelines already in place now for Macs. Ok. Guess I’ll figure out another way. Thanks anyway. My great grandfather was African American and born sometime around the 1860’s. On his marriage license he provided names of his parents and his place of birth. There have always been stories, however, that none of that information was accurate. In doing dna and genealogical research I seem unable to find any other people who are likely descendants of his parents (based on surnames and place of birth). Is there a way to use dna to find his actual parents? It seems that I should be able to find a group of people who are distant cousins and that I KNOW do not descend from any of my other ancestors… and one of their ancestors must be the actual parents (or parents’ Identities) of my great grandfather. Yes it can be done. It is often alot of work and requires that you have good trees for your other great grandparents. It also needs people descended from your real great grandparents or their parents to have tested. Testing at ancestry helps since they match trees to DNA for you. First, thank you! I think I finally understand the steps and can implement them on my information with confidence. I do have one question. In step 3, you write “… each case needs its own account at DNAgedcom so that the files for different people do not intermingle.” Where do I do this? How do I rename each case? Isn’t that already done in the m_ and a_ files? You need to create a separate user for each case you are working on over at DNAgedcom because when you upload the a_ and m_ files they go into the database for that user on the site. If you use the same account for two different cases their results will be interminged which defeats the purpose! Hi, just tried this and am getting the message Trees not Gathered operation cancelled. What might I have done wrong? Just try again, something may have happened to your connection. Are you on a PC? because the new Mac version was just released so be sure you have the current version f the client. On my PC, it updates itself automatically when I open it. Will this tool help solve a “parents are related” case? I am having extreme difficulty in finding my sister in laws bio father. My sister in laws bio parents share the same grandparents. I have found her bio mom and I do know that her father is on the other side (the Italian side) of her tree. We have had 3 people, all second cousins, from that side test. These 3 people all match each other in the 250 cM range like they should, however they match my sister in law at a much higher amount. 2 match in the 650 range and 1 matches at almost 1200 cM so I am pretty sure I know which line her bio dad comes from. I have a huge mirror tree built but there are so many “secrets” and affairs that the cousins dont even know some relatives. Any advice you could give me to help solve this would be greatly appreciated. My maternal grandfather was a NPE way back in 1863. I’m searching for my maternal great-grandfather. I made a mirror tree of the person that I strongly suspect to be him. I attached my maternal uncle’s DNA to this man’s son. I now have 18 Shared Ancestry Hints. Is that a reasonably good number? There is one that is listed as “Good” confidence and the others are “Moderate”. All are in the 5th-8th cousin range. The hints are on both the maternal and the paternal sides of the man’s family. Does it look like I’m barking up the right tree? What other steps could I take to further confirm this? That is not convincing but still possible. Look at the actual centimorgans shared with each. Do they fit the expected relationship? It would be better to have some 4th cousin matches. Anyone who shares your NPE’s parents will be a 3rd cousin. Can you find some of those and get them tested,? Did not find your explanation of the process abstruse, but then I haven’t actually tried it yet. Having read that, I think I will use the Windows XP platform I have installed on my iMac until I have got the downloads, rather than the Mac OS platform. Thank you again for your blog. First off, I would like to thank you for a very interesting, not to mention time saving, tool. My mom, who spent a lot of my childhood doing ancestry work the old fashioned way, would have had her mind blown over something like this. I managed to learn quite a bit from her over the years, but only recently began putting it into any practice. All that being said, I am confused on a few points. I get that you want to avoid close family trees. I am assuming this means any trees connected as first cousins or closer. The problem I am running into is, I don’t have any “files” in the Compare section above a 3. Obviously, this isn’t the fault of your program. While looking through all the names, I find mainly duplicate owners. In a few instances, 2. In the one casewhere none of the owners did seemed similar, it turned out two of them were mother/daughter. So I had to scrap that one. I thought perhaps if I went into the most common surname, and perhaps start with the oldest one, and build down from there? Using your “key tip” would, in theory anyway, generate quite a few possible ones I would think. In your opinion, would this be a viable option? Or, would it be more likely I may be twiddling my thumbs for a bit, hoping more people might decide to build trees? I think the most frustrating (albeit understandable) aspect is, I’m actually VERY close to being able to identify a birth parent. Seems one of the close matches is a close family-1st cousin on the matches. But, as I’m dealing with a closed adoption on my end, they have been silent in responses. Heck, I even have a name I suspect is theirs. Just a two person tree, with the spouse being listed as private. But no parent or sibling. So, not sure if the surname is birth, married, or perhaps even adopted herself. Thanks for letting me vent for a bit. When you have a close match who does not respond, you try and figure out their tree and build it yourself, private and unseachable using every clue. Obituaries are a great help with finding living people as is social media and various paid people sites. Then try out a theory, attaching your DNA to a possible parent. I have followed all the steps in this blog and although there are matches in Ancestry, every file I have downloaded/uploaded is blank. My m.csv file has 39020 names, but my a.csv file is empty, even though some of my “people” have trees. Do I need to be a paid member of Ancestry to fix this? I am not able to see anyone’s trees as the moment, as I’m a guest so far. I’m just starting out trying to trace my biological father. I was born in England but both my parents were/are Irish. Many cousins are American due to large amounts of emigration in the 1800s. Can I use the tool you describe above or does it only work if you have American roots? Please upload to MyHeritage as well. Still free and has been the key to several recent cases I have worked on. I have just been working with a woman with what looks like an Irish dad, so I gave her your email address as she can share some of the difficulties. The problem is not enough testers with deep trees to have GWorks be useful. However, if you build their trees and load them manually then the automation at DNAgedcom can help. But you can also start a tree in your desktop software and merge the key trees together there, then see if there are any duplicates. I will email some tips on that to you and will try and blog about this in the future. Thank you very much for your reply. I will follow your advice. “Get a paid account…” is probably what lost your audience’s interest? The issue I am having is that these ancestors had HUGE families. Following step 7 above I followed one tree down to someone in the early 1900’s, then built their spouse’s line back 6 or so generations. This morning I woke up to 85 ancestor hints!!! That seems like too many. I can’t have gotten it right the first time. Is the only step from here really to research research research? Or should are there other ways to narrow down even more? I am into a messy dna puzzle. My son matches 2 men very closely – One has some of his ancestors known – another is adopted and knows who his birth mother is – then my son’s half-brother took a dna test and he doesn’t match at all??? The man with the partial tree has a great grandmother who had 3 children before she was married. The half-brother and I are completely confused by the dna not matching – my son looks like their dad, his brother looks like his mom — their dad did alot of drugs inbetween creating these children – can that be a factor? What do we do to figure out this puzzle? I think I figured it out. My subscription hasn’t been verified because I registered with a different email than my Paypal email. thanks for a great post, looking forward to using the tool.